Stowe Cider & Lincoln Peak Vineyard | Touch of Grape | Marquette | $13.99/4pk 12oz cans | 7.5% ABV | Vermont maker collaboration! Hard cider co-fermented with red wine pomace. Stowe Cider & Lincoln Peak Vineyard | Touch of Grape | La Crescent | $13.99/4pk 12oz cans | 7.5% ABV | Vermont maker collaboration! Hard cider co-fermented with white wine pomace. Stowe Cider | Pippin Ain’t Easy | Pippin Cider | $8.99/500ml btl | 6.7% ABV | Pippin Ain’t Easy is a unique and diverse cider that pays homage to two varieties of pippin apples and is finished with the wonderful Ahmead’s Kernel. This is a serious cider for not so serious people. 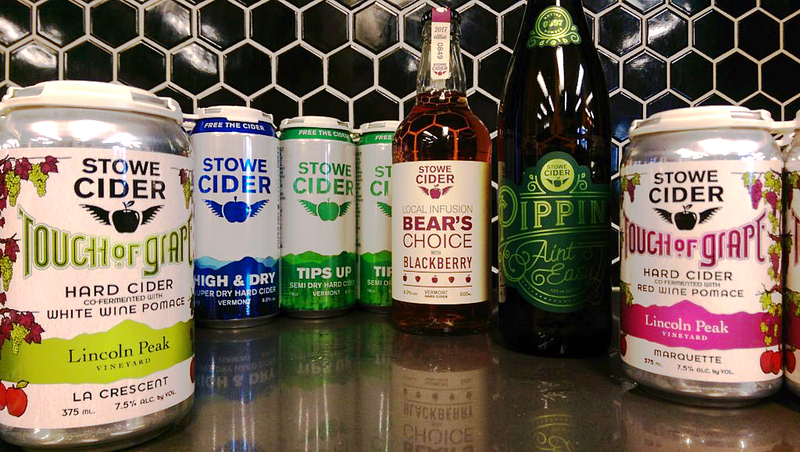 Stowe Cider | Bear’s Choice | Infused Hard Cider | $8.99/500ml btl | 6.3% ABV | “Bear’s Choice” is infused with blackberry juice, which creates an exotic mix of apple and berry flavors. Stowe Cider | Tips Up | Semi-Dry Hard Cider | $12.99/4pk 16oz cans | 6.5% ABV | Incredibly smooth and perfectly balanced. 100% locally sourced apples. Stowe Cider | Safety Meeting | Dry Hopped Hard Cider | $13.99/4pk 16oz cans | 6.5% ABV | One of a kind and delightfully hoppy. Dry-hopped with Citra and Galaxy hops. 100% locally sourced apples. Be the Favorite Guest at the Table! The feast is often the focus at the Thanksgiving table….but should it always be that way?? We’re pretty sure that if you show up to dinner with a bottle or two from the Beverage Warehouse fine wine cave, the oohs and ahhs won’t just be reserved for Aunt June’s green bean casserole! 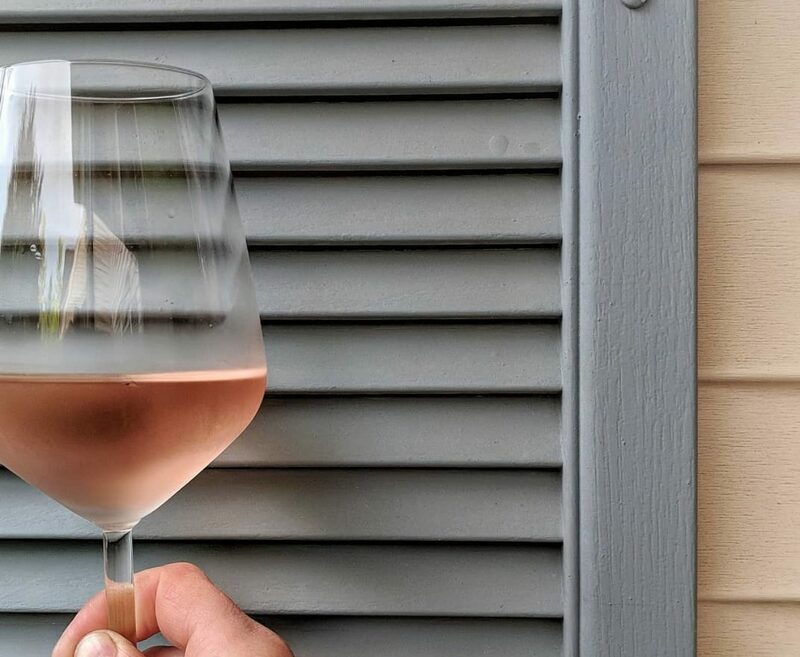 We want you to be the favorite guest at the table, and we’re making it easier from November 18 – 22 with a limited time 15% off sale on a few perfect Thanksgiving wines. We’ve been saving a handful of these back-vintage bottles in our temperature-controlled Wine Cave, and they’re in peak condition for popping. 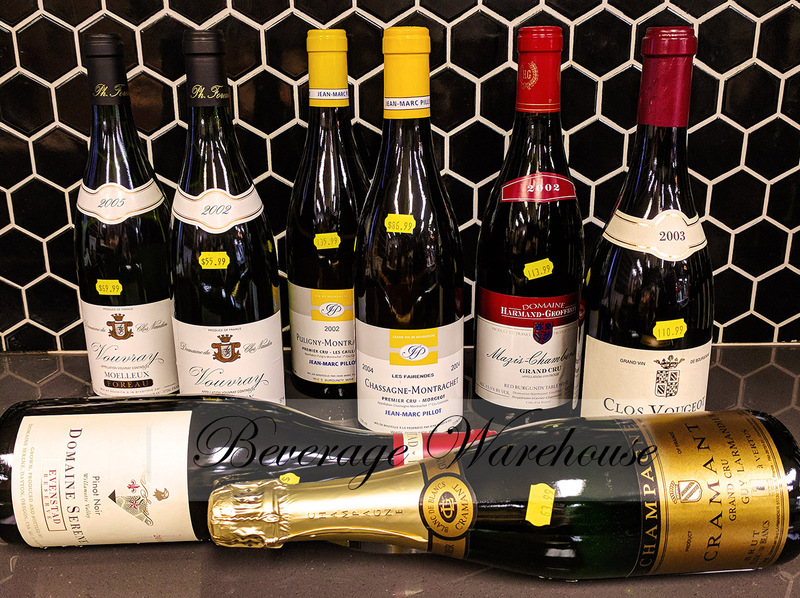 Read on for details about the wines included in the sale, and then email info@beveragewarehousevt.com to reserve your choice of Jean-Marc Pillot white Burgundy, Harmand-Geoffroy or Forey red Burgundy, Clos Nàudin Vouvray…and more. The Morgeot is known for its broad-shouldered wines, often the most rich and unctuous of the crus of Chassagne. In this case, Pillot’s vines are located within the most renowned sector of Morgeot known as “Les Fairendes”. This quarter-hectare parcel planted in 1970 benefits from that most favorable of positions to produce a wine that, while large-scaled, has a finesse and presence that elevates it above its more rustic colleagues. Jean-Marc Pillot | Burgundy | Côte de Beaune – Puligny-Montrachet | “Les Caillerets” | Premier Cru 2002 | $135.99 – SOLD OUT! Jean-Marc Pillot’s “Caillerets”, sourced from vines planted in 1969, is described by Pillot as perhaps the most complete wine amongst the 1er Crus. With its distinguished position on the slope above Morgeot and Champs Gains, the Caillerets manages to bring both power and finesse to the palate. There is a trace of exoticism to the dried yellow fruit aromas that include peach, apricot and mango. The mineral-driven flavors are punchy enough to sing through a rich meal, and the balanced, complex and gorgeously persistent saline finish refreshes your palate for the next bite! Vouvray produces the best darn Chenin Blanc you’ll ever taste, and Phillippe Foreau’s wines age remarkably well. Each wine exhibits an extraordinary panoply of flavors and aromas of fruit, floral and earth elements. The 2005 has really hit its’ stride, showing papaya, lemon curd, and honey on the nose. Round flavors of apricot and other stone fruits, plus a nice spiciness, provide tons of interest for an informed palate. This is a rich wine to complement rich food, with a finish that goes on for days! Vouvray is particularly awesome with baked ham, and/or with pumpkin pie (sweet with sweet!). These pairings hold even more true for older vintages. The 2002 Naudin Vouvray Moelleux is a rich gold color with aromas of apricots, mango, orange zest & white florals. On the palate, a welcome sweetness is balanced by terrific acidity. You’ll find deep earth, smoke, mushrooms and dark red fruit on the nose of this Grand Cru from Domaine Forey Pere et Fils. The big tannic grip and herbal notes tell you this is a serious wine, but the ultra-smooth palate and mini-explosions of cherries in your mouth may just convince you otherwise! This would be an especially excellent choice if you’re choosing a less-traditional Thanksgiving dinner, such as boeuf bourguignon or roast duck. This small family domaine are Gevrey-Chambertin specialists, making delicious, typically dark-fruit and wild spice character wines. The deep, brooding Grand Cru bottlings from Harmand-Geoffroy offer terrific value, and the 2002 vintage is no exception. The classic Pinot Noir nose of red and black cherry give way to flavors of cranberry, crushed cherries and earth, with a touch of rustic barnyard funk that’s unusual for Burgundy but fun for Vermont wine drinkers :). This ’02 is ready to drink but still has years to go, so treat yourself and your guests this year, or give a special gift to a wine-loving host! We couldn’t leave American Pinot Noir out of our Thanksgiving Wine Cave extravaganza! Ken and Grace Evenstad founded Domaine Serene Vineyards and Winery in 1989 when they purchased 42 acres of just- logged land in the Dundee Hills of Oregon to plant, grow and produce ultra premium Pinot Noir. Their Burgundy-inspired Pinots are vibrant, focused and deliciously complex, offering raspberry, cherry, cinnamon, mocha and subtle sage notes with a long and expressive finish. The 2010 Pinot Noir Evenstad Reserve has a very pure, easygoing bouquet with pretty red berry fruit complemented by bay leaf and forest floor aromas. The palate is medium-bodied with sappy red berry fruit, fine salinity and a gentle build to a classic tea-leaf finish. There are just a few bottles of this vintage available and they’re ready for your table! For the most up-to-date stock status on our Wine Cave offerings, email info@beveragewarehousevt.com or give us a call at (802) 655-2620. Cheers!